The MM400/800 is a new series of innovative measuring microscopes designed for industrial measurement and image analysis. They integrate key performance features delivering complete digital control for maximum measuring accuracy in demanding industrial environments. The systems support a host of new and expanded features including Nikon’s electronic connection hub connection that provides total integration of microscope peripherals managed by Nikon’s EMAX2 metrology software. The DP-E1 Data Processor is compact, yet easy to use. For quick measurements and data processing you can place the read-out display near the eyepiece while the control pad is placed at your fingertips. The DP-E1’s seamless interface to a PC platform makes it easy to perform computations and management of your measurement results. An enhanced body design using Computer Aided Engineering (CAE) for stress analysis enables the mounting of a larger stage to accommodate larger workpieces. A 300 x 200mm (12 x 8 in) stroke stage can be mounted to the MM-800. The design of the MM-400/800 series measuring microscope has been revamped to provide users with increased flexibility in choosing modules for system configurations. The system can be configured according to your needs, using the extra long toolmaker’s objectives (1x to 100x) or the universal system configuration using microscope objectives on a revolving turret. 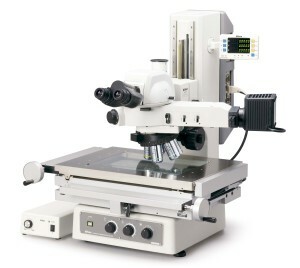 Also the construction of the entire microscope boasts improved rigidity, and offers large high accuracy digital stages. Nikon’s legendary construction maintains its excellent reliability and measurement accuracy over years of heavy use. The MM-400S, SL and MM-800S, SL models were created for use with Metronics Quadra-Chek and other 3rd-party digital readouts. They offer an economical alternative if non-Nikon data processors are used. Digital image measuring performance of the E-MAX software has been upgraded. Combined with Nikon’s digital camera and measuring microscope, the system achieves digital image measurements with precision never before possible. These are the first measuring microscopes to offer an optional TTL Laser Auto-Focus. This Laser AF system features a 0.5 second focusing speed with a repeatability as high as 0.5µm (20x objective 0.75µm spot diameter). The newly developed split-prism Focusing Aid (FA) delivers sharp patterns to allow accurate focusing during Z-axis measurements. Measurement errors due to differences in the depth of focus of different objectives are minimized. A continuous light control is built into the system, enabling light control from the PC without touching the dial on the main body to assure measuring repeatability. Measurements can now be made under the same conditions, ensuring precise video edge detection for repeatable automated measurements. This ring light enables illumination control from eight directions. It can be computer controlled using E-Max software for measuring repeatability. It allows edge definition and artifacts of difficult to image parts by controlling angle and intensity of the 8 segments. A motorized vertical movement mechanism with a 10mm/sec. speed has been incorporated. Up/down control is accurately provided with a dedicated controller. The use of a Nikon microscope digital camera and E-MAX software will streamline your workflow from observation and capture, to the storage of high-definition digital images of your workpieces. Illumination, X/Y stage and Z data can be connected to the MM Controller as an interface to an external computer running E-MAX software for data processing and system control.